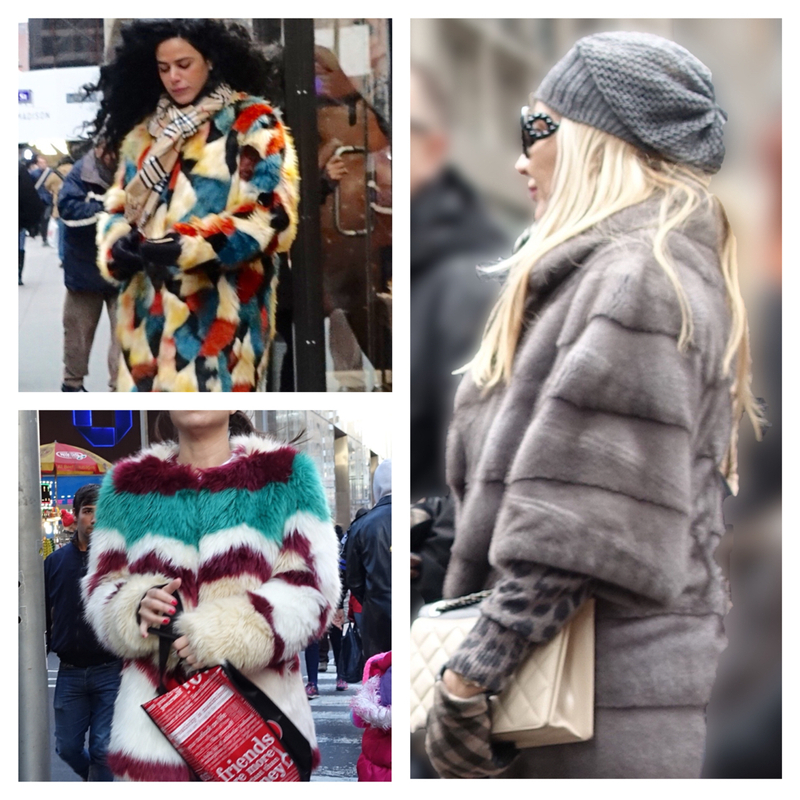 On my most recent trip to New York City, I expected to see ultra luxe fur coats as I did last year. Instead, I saw something very different. 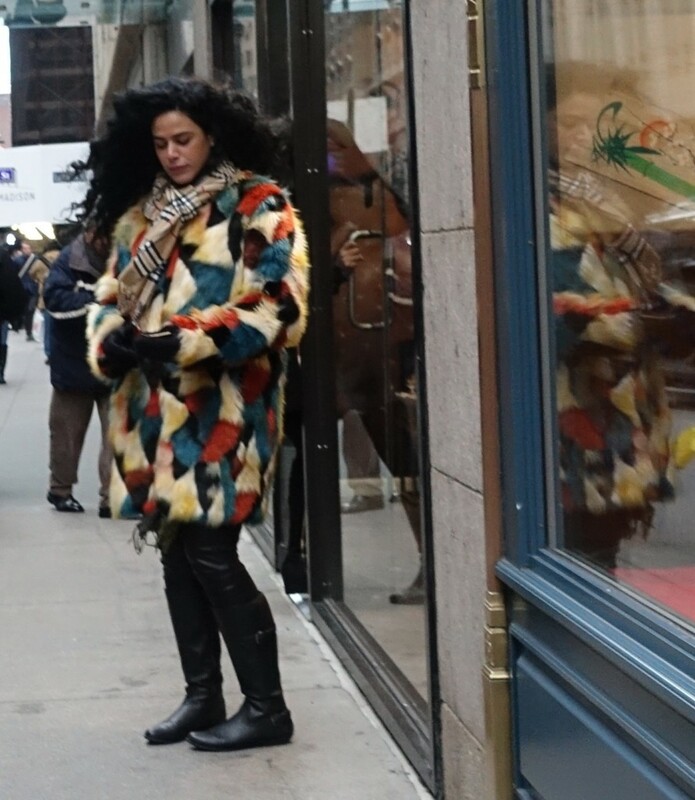 The classic fur coat was practically an anomoly, and I saw more of what I call fantasy fur (so fantastical, I wonder if I’ve dreamed them up): a wonderful assortment of crazy colored/patterned faux fur, genuine fur mixed with other materials, and fur accessories and embellishments. The ultra whimsical furry pom pom key chain has become so popular that it nearly seems commonplace. But I still wish I had one on my handbag to play with (I would have been a cat if I had had a former life). A beanie’s furry pom pom is a close second in amusing me. And speaking of headgear, I never get tired of seeing a Russian-style fur hat. Apparently, some fashionistas in Russia avoid pairing one with a fur coat. 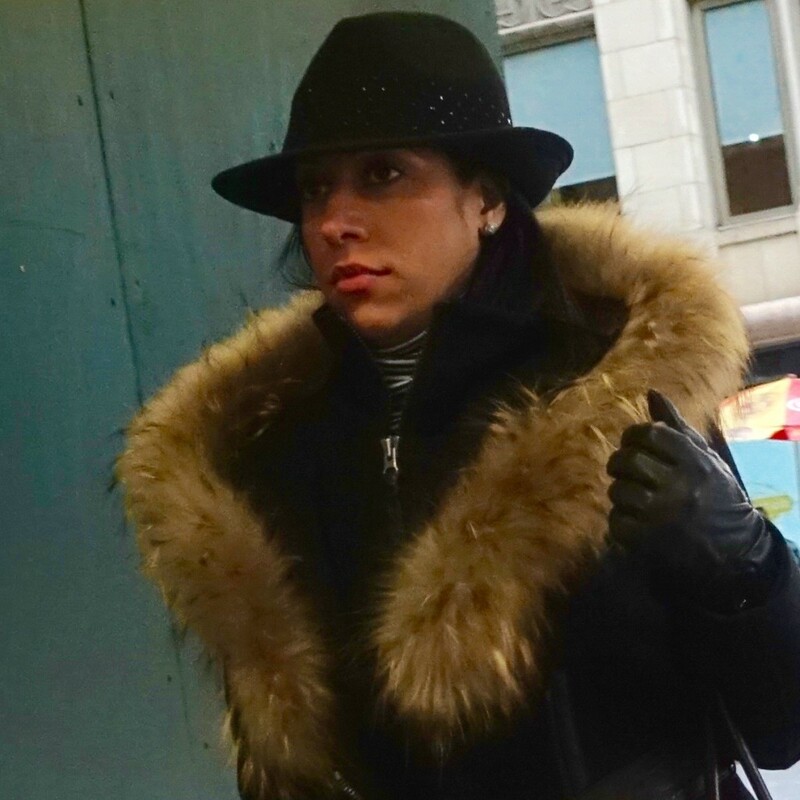 When I saw the fur collar below, I could only think, “Va-va-voom!” With that hat, I am reminded of Humphrey Bogart and his leading lady. I love the clean, modern lines of the coat to the right (below). 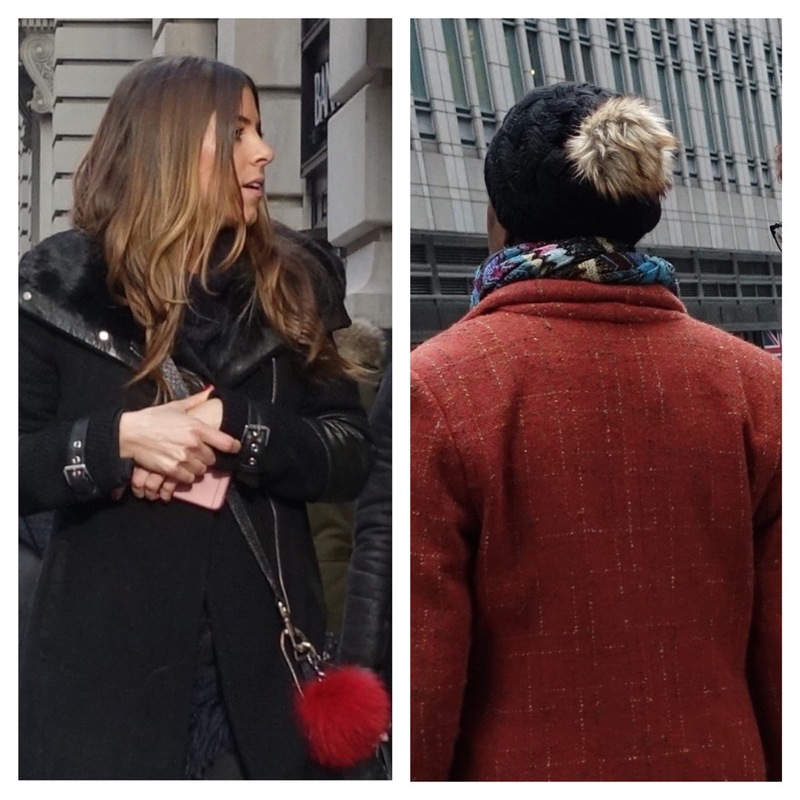 And speaking of current, look at the mix of materials of the other coat’s design: fur at the collar above quilted polyester or nylon (think puffer jacket), non-quilted sleeves of the same polyester/nylon, and wool below; another interesting detail is the zipper at the bottom – I’d guess, on each side. Although I wish athleisure would just go away, I was instantly drawn to this look. It reminds me of a raccoon – but in a good way! Now this coat has movement! I love the way this woman avoids wearing more demure clothing underneath it. 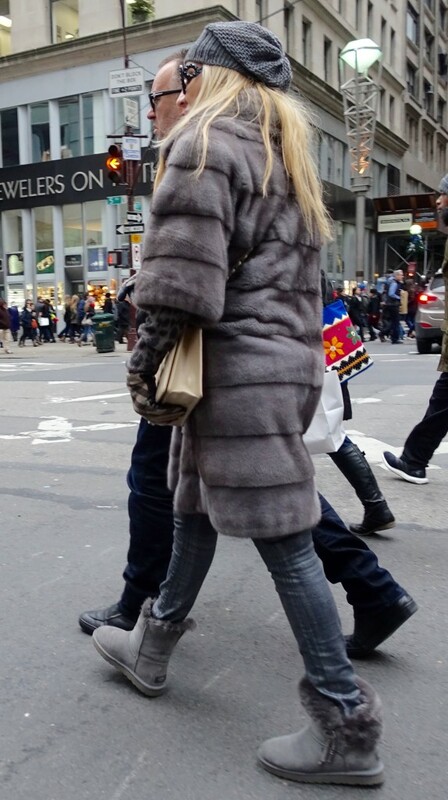 A grey paneled fur with three-quarter length sleeves is already eye-catching, but this woman combines hers with stunning accoutrements: grey cap, fanciful black and white glasses, plaid gloves, denim in a similarly-colored wash, and grey fluffy Uggs – which I don’t quite understand why they don’t bother me. Wildly-colored furs are so much fun. With such vivid dyes, I seriously can’t tell which are genuine and which are faux – the animals should rejoice! 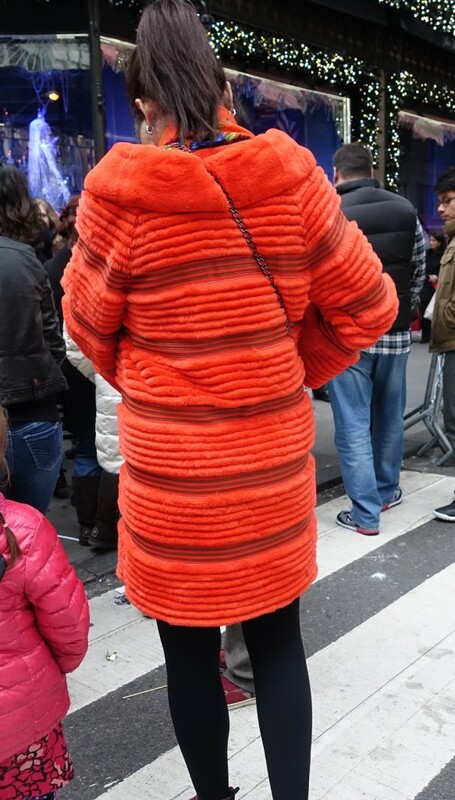 For some more brightly-colored furs, see our recent statement coat post. This next fur and wool coat in beige and greyish blue is a gorgeous mix, especially with the coordinated scarf, emphasizing the vertical axis – my hands are clapping. This last fur of cubist-like design is seriously oversized – something which can be tricky to pull off. It works best on super tall, lanky models or accompanied below by a narrow silhouette, dark colors, and a higher heel. Then there is this woman whose amazing locks make it of perfect proportion. Fur has ong been a symbol of luxury and sophistication. It is surprising and exciting at the same time to see how the classic fur is being turned on its head, so to speak: dyed every color of the rainbow and designed to look like more than just fur or included in a garment as one of many materials. Which is your favorite fur? I enjoyed this post so much! I am so accustomed to seeing the same winter look when it comes to outer wear, it was nice to see something outside the “boring” box. My favorite was the athleisure look! Of course the muse resembles a top model and makes those leggings look great! Thanks for commenting on your favorite look, Melissa! The athleisure look is definitely model-off-duty. I’m happy that you enjoyed the post!